My friend, Kiwi board game inventor Amanda Milne’s new game is now at prototype stage and is being play tested. Its working title is The Devil’s Goat and is based on Guernsey. Turns out it was sparked off by a children’s short story I had written for the Guernsey Literary Festival. As this story was published as a very limited one-off, I have been contemplating reissuing it as an ebook but if Mandy’s game takes off I might have to pull my finger out. Witchcraft is said to abound in the island. Both black and white witches are said to practice in Guernsey. The black witches were said to practice ritual witchcraft. They held assemblies and covens to summon demons and devils. The black witches were said to be led by an unknown person, who often disguised himself as an animal. Although the leader changed, it was always known as the Devil. Reports say they usually disguised themselves as cats and goats. A couple of iterations on from the first rough sketch and I have a working prototype that is about to start formal testing. The working name is The Devil’s Goat. In the game, players take on one character who lives on the island. Each character has their own secret agenda. Rumours abound, goat sightings and attacks occur; journalists pay money for stories true or otherwise. Each player is trying to achieve their own goal before the Devil’s Goat runs amok and tries to kill them. At that point in the game it becomes a team effort to stay alive: the characters versus the Goat! For more on Mandy’s great idea, visit SchilMil here. 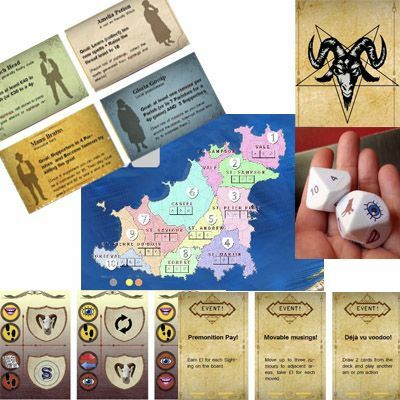 This entry was posted in Fiction, Games, Guernsey Literature, Marketing and tagged Amanda Milne, Defenders of Guernsey, SchilMil Games, The Devil's Goat. Bookmark the permalink.